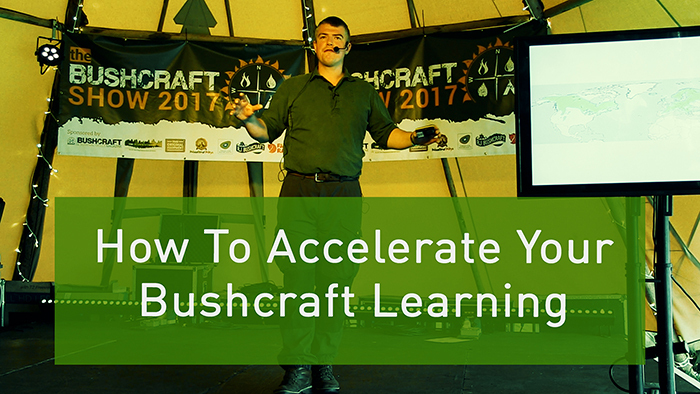 The above presentation was given at the 2017 Bushcraft Show. It can also be viewed on my YouTube channel. Yes, this type of thinking can be applied to many areas. Your nephew is a luck lad. Very good, Paul. It’s a pleasure to hear you speak and i’d be surprised if anyone left that lecture and wasn’t motivated to work their butts off on specific skills to improve. Like I’ve said before, even in their gardens, or homes if you can hide the mess from the partner – you really don’t need a woodland on tap to become good at many skills. For those who truly want to improve their practical wilderness knowledge, that golden word obsession is far and away the key to success. You can take the dog for a walk and find a fallen branch on the side of the road to take home to make a bow drill set, cordage, carving material, tinder, tree id, candles, digging stick instead of letting them chew it to bits, walk the downs to identify trees and plants, dig for roots in your back garden, pick up naturally shedding birch bark from the floor in towns, walk the river bank and pick up fallen cattail leaves to thatch baskets or fallen stems on the floor to make hand drill sets, find fibers to twist whilst on a walk, nettles in your back garden to eat, make cordage, tea etc, dandelion to eat from the garden or the root to create a drink, ask a tree surgeon for the wood they will otherwise chip etc etc etc the list is truly endless … I hate the excuse “I don’t have land”, work around it. Rant over, brilliant work mate, very impressive. Hi Zed, thanks for your comments and I think your approach is a humble and honest one, which will result in you learning a lot, not only looking cool. Great talk Paul, nice intro and going back and forth to the Pareto-principle, made your point very clearly. I see loads and loads of canvas, leather and feather-stubs rather than -sticks ( must say, I also posted a knife and featherstickphoto a few weeks ago) on Instagram lately, and the knife is being reinvented every week it seems. Started weeding through the profiles I was following as I’m being flooded with the same photos over and over again. As I’m now healing after surgery I finally found the time to read and learn more about birds and how they look like in the air (profile), which is a skill/knowledge that was one of those 5% -skills up untill now. Yes, time spent on studying nature is never wasted. I hope you are healing well my friend. I wish I could have come on over to the show and taken a lot of it in, but my situation leaves me unable to do many of the things under the umbrella of “Bushcraft”. I have some basic kit, a tarp and tent, a sleep setup, fire lighting things, food for the road and a means to cook it. The things I lack are wet weather gear, and a pack to pack it all in. I have noticed that you (Mr Kirtley) use a Karrimor SF pack with zip on/off pockets, may I ask if you would recommend it for someone with lower back problems? And if so, what version do you use? Does it have a hydration bladder, or can you add one after the fact? Thank you againg for the video. Have a good one! I’m not a chiropractor or specialist back doctor so I can’t recommend a rucksack one way or the other based on “lower back problems”. Sorry. It may be best to speak to a physiotherapist or chiropractor. Hi Paul, I loved this talk. The comparison between the number of words in a language to the ones needed to understand it on a basic level, and the vast number of skills out there in “Bushcraft”, and the ones you need to get really skilled at to get by in a “Bushcraft” situation, was very effective. As always the audience (myself included) were captivated. As you said, aim to get extremely proficient at the most required tasks. All the best, keep safe, Dave H.
Hi Dave, it’s good to hear from you and I’m happy to read you found this presentation very interesting. If you don’t mind I’d like to try and apply your thinking to future programs for not just my own children but all of the kids I work with. If you ever have a few moments to expand on how you might do this I’d be very interested to hear your thoughts! I’m glad you appreciated the analogy. I’m always interested in learning, teaching, coaching, improving performance of skill acquisition and the concept of having a small but highly applicable functional vocab in language has been around for a while. Further, I’ve applied the Pareto principle in my life and my work for many years. It all seems to fit together very nicely. I hope you can indeed use some of this in your own programmes to improve/speed up the learning of the kids. Really enjoyed this, I think your mentality to learning is excellent and specialising is something I am going to have to start doing. Paul, This Video was unlike others. Everything I’ve viewed, and I’ve been with you for some time, has all been the leading source I’ve ever found for real world teaching and information that I both directly benefit from and enjoy. This specific one has indeed, put my thinking into a new focus! I have a plan now, a way to organize my efforts in a new manner that will provide the most benefit with a faster and enjoyable concept. Thanks for your comments on how this presentation has been so useful in forming a plan for you to move forwards with your skills. Thanks also for your kind words. I’m glad this video resonated so strongly with you. It is absolutely necessary to own as many bushcraft skills as possible, but, you’re right, they should be perfectly owned, which means learning from the best of the best and applying these to make them our own. As a youth, I did not know any of these as “bushcraft”, but I read Scouts manuals (both English and French) to get different perspectives, and the skills were translated perfectly, regardless of language, as the knots were the same, the pioneering skills were the same, etcetera. Bushcraft is a universal skill, and from many different cultures, commonalities can be seen. My skills at fire making using paper matches in any weather or season were honed, because of need, at a young age. I loved going outdoors and cooking and being warmed by a fire, so I had to practice in all conditions using paper matches. Later on I discovered ferrorods, and began expanding my fire skills with these; then, I experimented with solar, then percussion, and finally, because I knew I could manage without friction very well through the years, I ignored rubbing sticks together, being confident that I could make fire whenever needed. It was your encouragement (or perhaps bold-faced challenge) that success with the fire bow technique is a “defining moment of bushcraft”, which set me off to attempt it. I consciously performed the posturing and the execution, as you demonstrated, and voila! an ember! But, as you said also, bushcraft is about knowing the bush, what to use, how, when, where, and why that matters, and that takes a lifetime to master, but it’s an enjoyable and rewarding journey. One needs to experience the bush to uncover its bushcrafting values. That said, I am privileged to have you as a mentor, and teacher of bushcraft. Having read and seen the likes of Mors Kochanski, and Ray Mears, through books and videos, and having studied the works of other greats like Baden-Powell and Kephart, it is obvious that you easily rank among them. This is not blowing smoke up your derriere, it is a fact. Your skills and knowledge are most impressive, and yet you dedicate yourself to sharing all you know. It is most appreciated. Indeed Andy, a journey always begins with the first footstep. Thanks for your feedback Phil. Much appreciated. Hi Paul, from someone who is fumbling along this is good to hear! For the last month especially I’ve been asking myself if I should breakdown everything I’m learning into segments of what bushcraft items I need to know well I.e useful trees, edible plants, means of producing a flame etc… and concentrate on these for what I want to do, instead of trying to understand everything! For those who found this video helpful Paul runs an online tree and plant ID course (as well as many other practical bushcraft courses) which, like his presentation is broken down in a way that is easy to follow and highly recommended! Good to see you here again. I’m glad you found this presentationuseful in your attempts to rationalise the things you want to learn first. Thanks also for your positive words about the online Tree and Plant ID course as well as the physical courses. Another useful and enjoyable presentation from you, thank you. I found it good from the point of view of ‘that overwhelming feeling’. When we set out on the bushcraft path, it can seem as though there’s so much to learn that it’s hard to know where to begin. So lots of great info there, I’m going to apply it as wisely as I can. Thanks for your comments. I’m happy to read this was both enjoyable and useful. Good luck with streamlining and tailoring your bushcraft path. You know where I am if you have questions. Thanks for your thoughts and feedback Peter. It’s much appreciated.